Summer pre-law programs are an excellent opportunity for undergrads to learn more about law school! Some are paid and other programs have fees and a cost for students to attend. These programs are a different way to explore being pre-law during the summer months. These programs are a great addition to a resume, but are in no way mandatory for a pre-law student. Some universities offer pre-law programs on their campuses. This is a way for you to learn more about law school, visit a law school and campus, and learn more about law school in a structured setting. If you are considering attending law school at any of the schools below, these summer pre-law programs are an excellent way to get your foot in the door and experience what your life could be like there throughout law school. Program Information: The PLUS program is a free, three-week summer program that will: provide participants with a deeper understanding of legal education via the program’s rigorous doctrinal and experiential skills-based curriculum; help participants develop essential core competencies needed to succeed in the law school application and admissions process, as well as insight into navigating the process; and expose students to a wide range of career paths within the legal profession. Students must attend all classes and participate in all program activities in order to be accepted and to receive a stipend. This is a full-time commitment. Therefore, students must be available during the day and some evenings, and have no outside commitments that would prevent them from giving the program their full attention. Students must agree to provide PLUS administrators with education and career updates after completion of the program. Program Information: The Robert H. McKinney School of Law Summer Law and Leadership Academy is a one-week experience designed to introduce undergraduate students from historically underrepresented backgrounds to law school and various careers that they may pursue with a law degree. If you are selected for the Law and Leadership Academy, you will learn about hot topics in the law and strengthen your academic skills. Program Information: College students considering law school, especially rising seniors and those from groups historically underrepresented in law school are encouraged to apply. The program is open to undergraduate students (and recent alums) from any undergraduate institution. Over 150 Scholarship Opportunities for Undergrad and Incoming Law Students! Whether you’re heading off to law school this fall or staying here to continue your pre-law education, you’ll want to see this: scholarships! Could you use an additional $500, $1,000, or even $40,000 towards your undergrad or legal education? Then take a look at this resource. We have compiled over 150 scholarships available for BOTH incoming law students and pre-law undergraduates. Head over to our Compass page to find the full listings–but hurry, because some have upcoming deadlines! The full spreadsheet with 150+ scholarships is the very first item posted on our Compass page. If you are an Illinois student who is designated pre-law: All students who are designated pre-law already have access to our Compass page. Log in to Compass and under “My Courses” look for OPEN LEARNING: Pre-Law Advising Services. 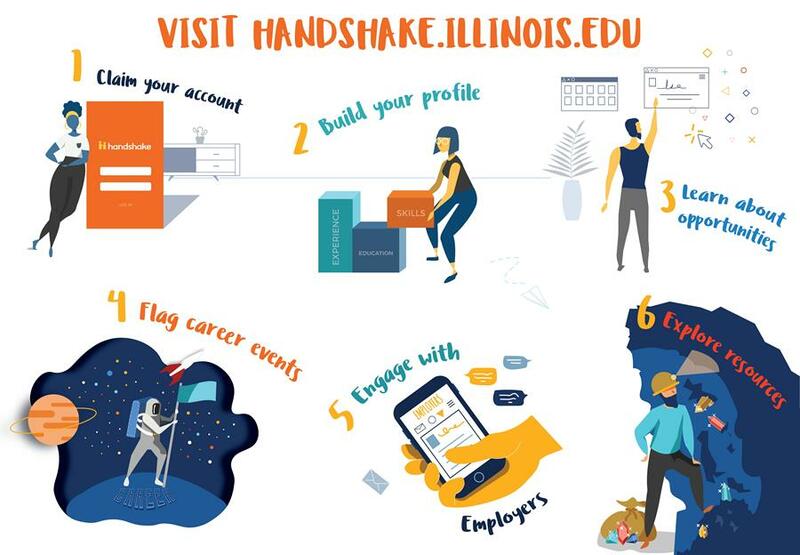 If you are an Illinois student who is not designated pre-law: Click here for instructions on how to add yourself to our Compass page. 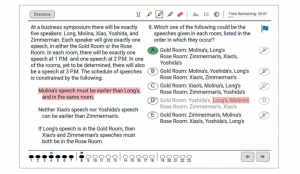 Sneak Peek of the New Digital LSAT! Beginning in July 2019, the Law School Admission Council will transition to a complete digital version of the LSAT, the standardized test used by more than 99 percent of all law school applicants in the US. The digital test will be administered on tablets. 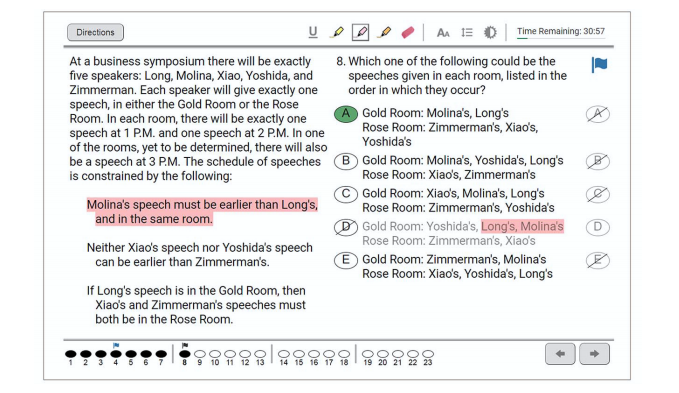 This screenshot from the Logical Reasoning section shows a typical question and some of the features and benefits of the Digital LSAT. Move to unanswered questions with a single tap on the answer bar at the bottom of the screen. IMPORTANT: The July LSAT will be the first LSAT to offer the digital version. Testing centers will be randomly chosen to have either the Digital or Paper exam. Students will have the opportunity to choose whether to keep their scores. If a student decides not to keep their score for the July LSAT, their score will be disregarded and will not be sent to any law schools. Additionally, the LSAC will offer students the opportunity to take a free LSAT in replacement of the July test. If you have any questions about the digital LSAT, please follow this link to the LSAC website https://www.lsac.org/frequently-asked-questions-about-digital-lsat. Harvard, NYU, and Yale Law School Online Webinars! Harvard, NYU, and Yale Law School would like to invite to you to participate in their Online Information Sessions. Participants will have an opportunity to submit questions about the universities curriculum, student life, and the admissions process. Follow the link to register for these events. In this session, Access Lex will discuss the costs of pursuing a legal education, describe the financial aid application process, review the available financing options and identify ways your students can be financially prepared to achieve their goals. 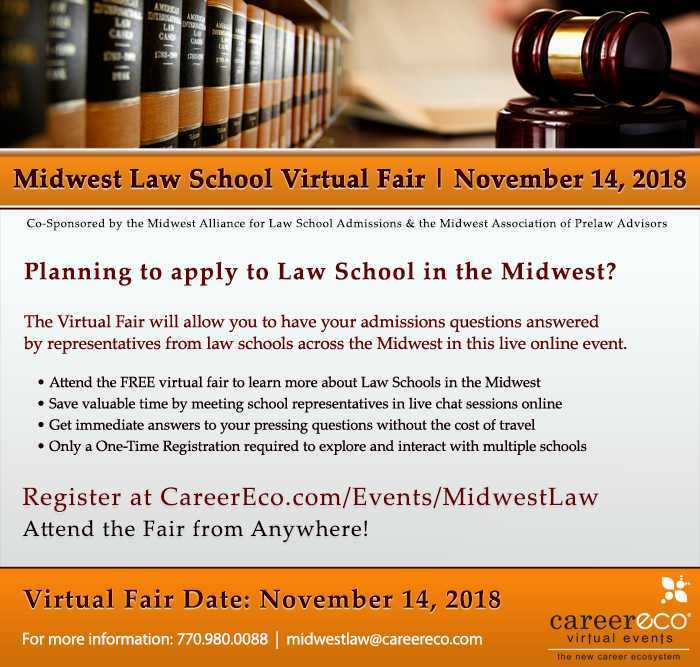 Upcoming: Midwest VIRTUAL Law Fair on November 14! Were you unable to attend our Law School Fair? Over 25 Midwest law schools will be available to chat online with you about the admissions process, their schools, scholarships, journals, etc. This event is FREE and participants don’t need to travel! Click here for more information and to register. The University of Illinois Pre-Law Honors Society and TestMasters will be administering a free full-length mock LSAT under official test conditions on Saturday, November 3rd from 10AM-2PM in Lincoln Hall, Room 1000. All UIUC students are welcome! Seating is limited: RSVP HERE! Some fall law school open house opportunities. Make sure you check the websites of your selected schools for these very helpful events. University of Chicago: Monday, October 29, from 1-5pm or Monday, November 19 (NOTE: That’s during Fall Break! ), from 1-5pm. Click here for more details. Chicago-Kent: Saturday, November 10, 9:00am-12:30pm. Click here for more details. DePaul University: Saturday, November 10 – 10:00 am-1:00 pm. Click here for more details. 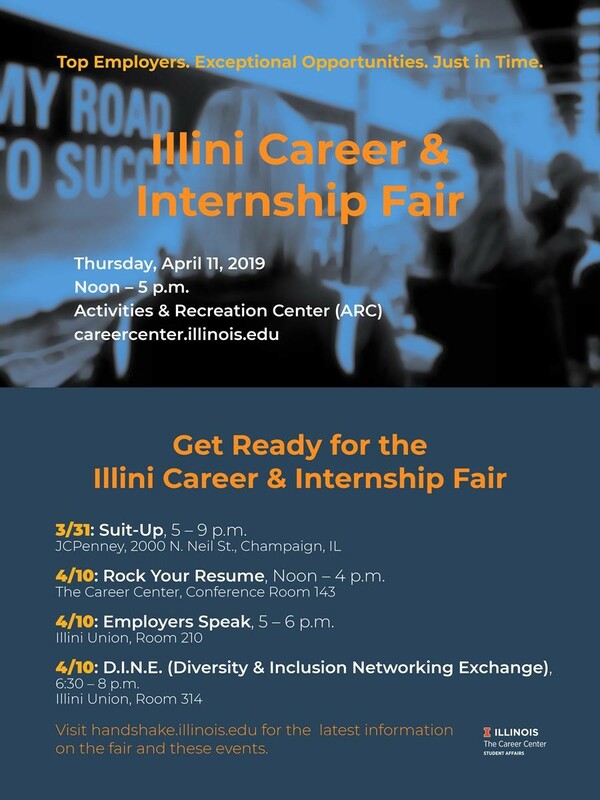 University of Illinois: You can schedule a visit, attend a class, and meet with faculty, students, and senior administrators to discover all that Illinois Law has to offer. If you are on campus, now is a great time to visit! Click here for more details. John Marshall: Open House Saturday, November 3, 9am-12pm. Click here for more details. Northern Illinois University: NIU Law offers Information Sessions at both their DeKalb location (12:00 pm Mondays, Wednesdays, and Fridays) and in the Chicago Loop (on Tuesdays at 11:00 am). Click here for more details. They are also hosting a November Open House: Admissions Strategieson Saturday, November 10. Click here for more details. Northwestern University: Virtual tour available. In addition, student guided tours are offered Mondays and Fridays at 12:00 pm. In addition, class visits can be scheduled while classes are in session. Click here for more details. Southern Illinois University: Visits can be scheduled Monday through Friday, 8:00 am – 4:30 pm. Click here to schedule a visit. There are opportunities to sit in on classes throughout the fall. For more information about upcoming Open House Days and how to prepare for these visits, go here to our blog post from October 3.
the Summer 2019 session. The SPIN projects are open to students in any major and any year of study; international students can apply. For more info contact spin@illinois.edu or visit spin.ncsa.illinois.edu.